ESPN 30 for 30 documentary has a good chance of being in the running for the Oscar. This five part over eight hour examination of the OJ Simpson case and race in America is easily one of the best of the best films of the year. A stunning detailed example of a terrible crime placed in the context of the time it happened and out time some 20 years on is a film that is a shining example of what documentary filmmaking should be. 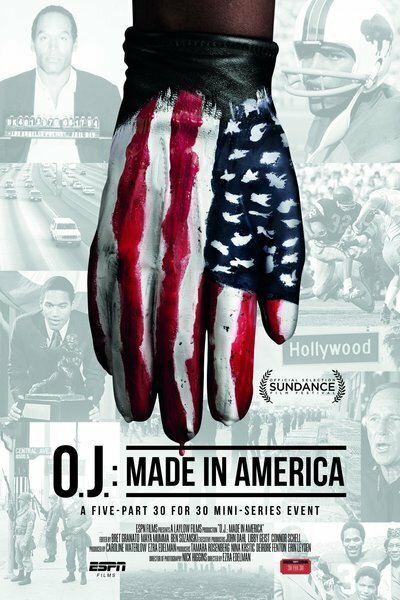 The film covers the life and times of OJ from his early days in the projects to his rise as an athlete to his post sports career as a celebrity an on to infamy. While the film focuses on OJ it very deliberately places him with in the story of race relations over his lifetime. It's a portrait of a man seeming to be outside of time and race in an age where question of race were filling the headlines. I don't know where to begin discussing this film. Having watched it in a marathon screening there simply is so much to take in I still am processing it several days after finishing it. I very much would like to go back through the film once more to see how it all plays now that I know the trajectory of the piece. I know that there are bits early on that are echoed in the end that need to be firmed up in my mind. While the film originally ran on TV on five consecutive nights I can't imagine seeing it that way. While I know seeing that way will allow reflection of each part (perhaps I should have reviewed each part individually) there is an urgency to see it all. I originally saw the first part on ESPN on demand when it originally aired, but it wasn't until I was laying sick in bed that I sat down and watched it all from start to finish via DVD. The story grabbed me in a way that few stories have, which is amazing since factually there is very little new here. What is new is how director Ezra Edleman re-frames it in terms of the history of race and of how we see legal proceedings. What does OJ mean in terms of race relations and what does his story say about who we are as Americans? I'm going to be pondering it for a very long time. I am in awe of the film. Watching the film I can't help but consider how the film is going to be viewed by Oscar voters. Will the films marathon length and origin as a TV doc hurt it's chances? Will they feel that Ava DeVurnay's 13th is more deserving? Or if not more deserving at last more manageable. One of 2016's unquestioned best films.